Wednesday, February 10th we got up at 6am to check out of our Melbourne hostel and head for the bus stop for the next leg of our journey. Helen and I had booked a 3-day tour along The Great Ocean road and into the Grampian Mountains through a company called Wildlife Tours, and I was admittedly very excited to start this more adventurous part of the trip. After we'd picked everyone up at their stops, we left the city and drove southwest for an hour until we hit the coast and stopped for coffee, tea and biscuits at what may have been the most southern point of Australia I've touched during my time there. Our tour guide's name was Eric, and we quickly came to realize he was AWESOME. Funny, kind, and full of fun facts since he was a native who owned property along the road, we spent the day with him pulling off at select spots along the coastal highway, learning interesting facts as we went. We spent some time in the afternoon at a local camping ground with a variety of parrots, cockatoos and lorikeets, as well as WILD KOALAS. This was really my first time seeing the sleepy bears since arriving, and it was amazing to see them in the wild rather than in a zoo or wild animal reserve. They were so close you could almost touch them, and the birds would eat seed right out of your hand and sit on your shoulders. wild Koalas doing what they do - sleeping in trees. We made our lunch stop just down the road from there at a city called Anglesea and started to meet the rest of the people on our tour. Most were between 18-28, all on holiday, their gap year before Uni, or on work visas traveling from city to city while they worked. We were lucky to get a super nice group that all got along well, and everyone became friends quickly over scoops of vegemite ice cream (yes it's real, and not overwhelmingly disgusting). The rest of our first day we spent walking through an ancient part of the rainforest with 300+ year old trees, pulling on and off the road, stopping to see landmarks like the Twelve Apostles and the London Bridge, and finally arriving to watch the sun set in Thunder Bay and spent the night in a city called Warrnambool. The hostel there had a built-in bar, so we all quickly changed into pajamas and got to know each other more over drinks before bed. Day two we woke up, ate breakfast, and loaded into the bus again after a hilarious round of the name game. We started the day by driving through Tower Hill National Park, a reserve based in the creator of an ancient Volcano, and home to a variety of wildlife including a wild Emu that ran in front of our bus. 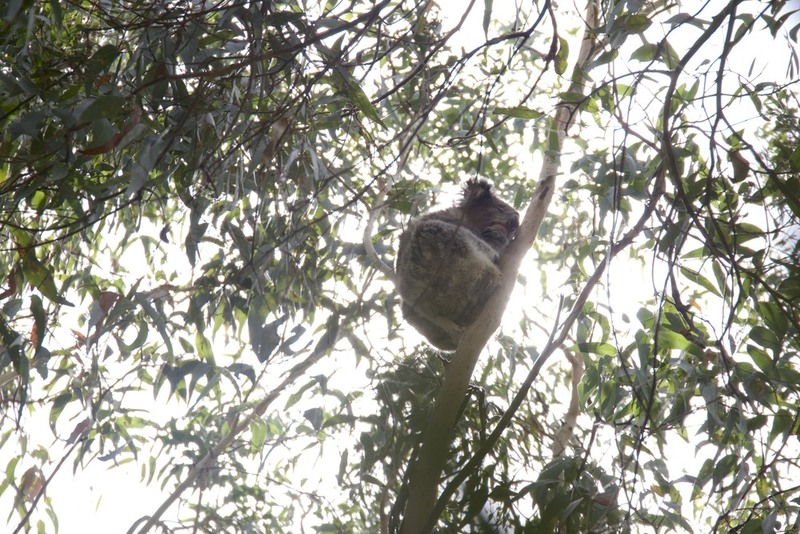 We hiked to the top of the volcano that was once 5 kilometers wide and found a sleepy little Koala not far off the path. We then went more into the park and stopped for morning tea with ANOTHER koala sleeping in the tree right above our heads! That night we all worked together to prep a delicious proper Aussie "barbie" complete with Kangaroo meat, awesome veggies, and TimTams for dessert. We all sat outside for hours talking, laughing and drinking local beers and wines until we finally turned in. The next morning we woke up early, ate a quick breakfast, and took a quick 10minute drive up into the mountains to start our final hike through the Grampians to "The Pinnacle", one of the most prominent rock formations in the mountain range. The hike took about 2hrs up and 2hrs down thanks to lots of stops for scenic views and epic photos. We spent quite a bit of time wandering off the path for views of the mountains, climbing through caverns, making the rocks echo. We finally reached the pinnacle around 9:30/10am, and the views were certainly worth it. This was the kind of hike/views I'd been hoping for during our adventure, and I felt a bit at home overlooking the massive drop-offs down the mountains and scenic overlooks across the valley. We took our last group photo atop the peak, and headed back down the path without many stops. Helen twisted her ankle early on during our hike, but made it the rest of the way up and down like a trooper. Once we made it down the mountain, we grabbed a quick bite in the town and then switched to another bus destined to Adelaide. It was surprisingly hard to say goodbye to the half of our group headed back to Melbourne. I imagined this part of our trip to be fairly....lonely(?) since it was just Helen and I without anyone else we know, so it was super awesome to meet so many good people and and make such quick friends. Some of them are coming to Adelaide with us, so I hope we'll be able to meet up with them at least one night this weekend. Adelaide is the end of the line for me and my time in Australia. It feels like the end has come quickly, but so slowly all at once. This adventure has been nothing short of amazing at every single turn, and I'm quite heartbroken to face the reality that it's quickly coming to a close. I'm sure it will be nice to be back to a city where Helen is a familiar and for us to have more of a set home base than we've had for the past week, but man - I can't comprehend how much of this journey is already behind us. I've done nothing but fall in love with this country during my 20 days here - every last part of it. While each city has been drastically different both in scenery, climate, and culture it's been awesome to see so much rather than just one city, and realize how these landscapes feel just as familiar to as they are different to anything I've seen before. As I write this, we're one hour out of Adelaide after six hours in the bus. I'm ready to get "home", eat and sleep heavy after our big hike and long hours sitting. I'm excited to meet this side of Helen's family as well, a neat opportunity since they live so far away compared to many of our other relative's other extended families. I think my last days before I leave next Tuesday will be just as full of new experiences and adventure as they'll be full of downtime and good conversation - a perfect mix to end my holiday. Here's to making the most of my last four days in this hemisphere.